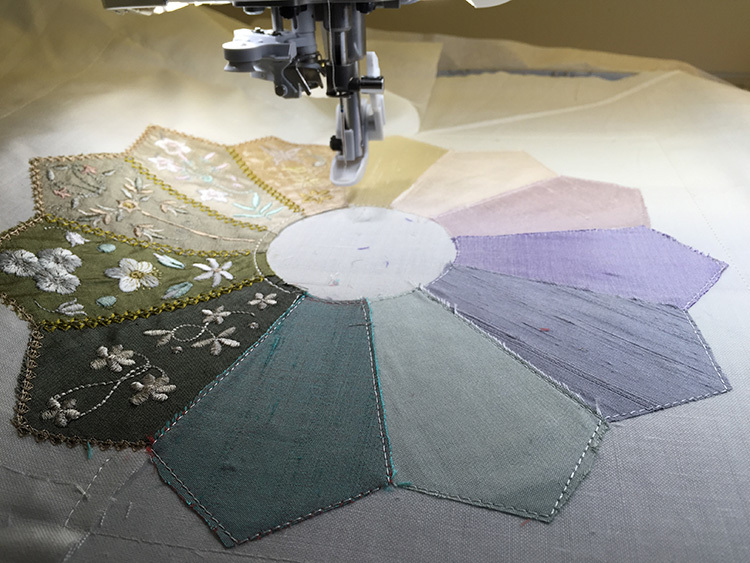 Well we all know that disasters happen in the sewing room and I discovered my big mistake yesterday when I completed the second half of my Dresden style “Epic” crazy quilt. The secret is how to put it all right without going back to the beginning….. 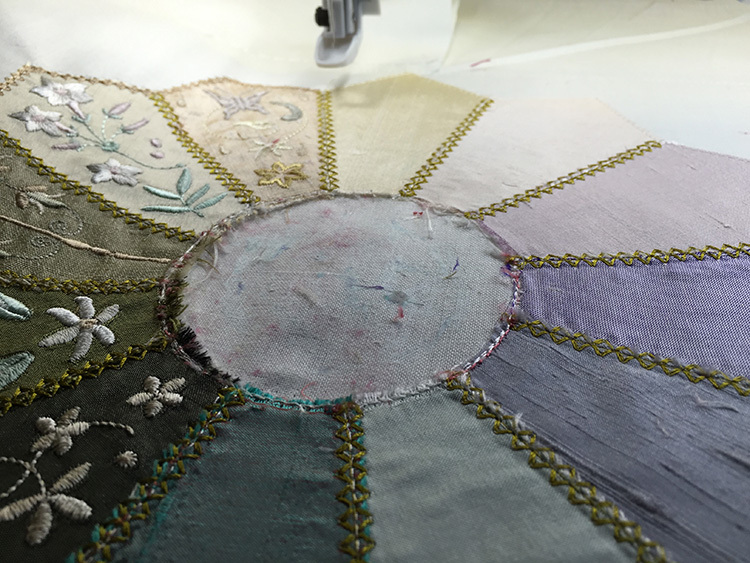 I had already chosen the 7 fabric pieces for this part of the design, slowly moving from green, through golds to mauves. It was only when I went to hoop up the second part of my Epic quilt that I realised that I had not allowed enough fabric for it!!! We have all been there haven’t we? As the design had been stitched on cotton fabric, I hooped up another piece and stitched the placement lines. I then cut away the inner design edges on the first design and carefully positioned it along my placement lines. 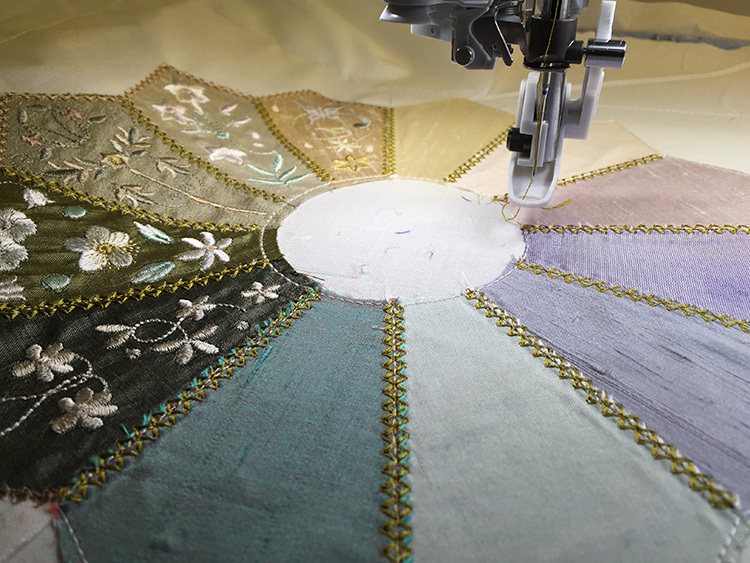 If I am unsure about the exact placement of any design I move the machine through the important sequence, checking to see that the needle goes into fabric at the correct place, adjusting if necessary and going back to through the sequence to make sure that earlier stitches are not out of alignment. This is what I did with the placement stitches. 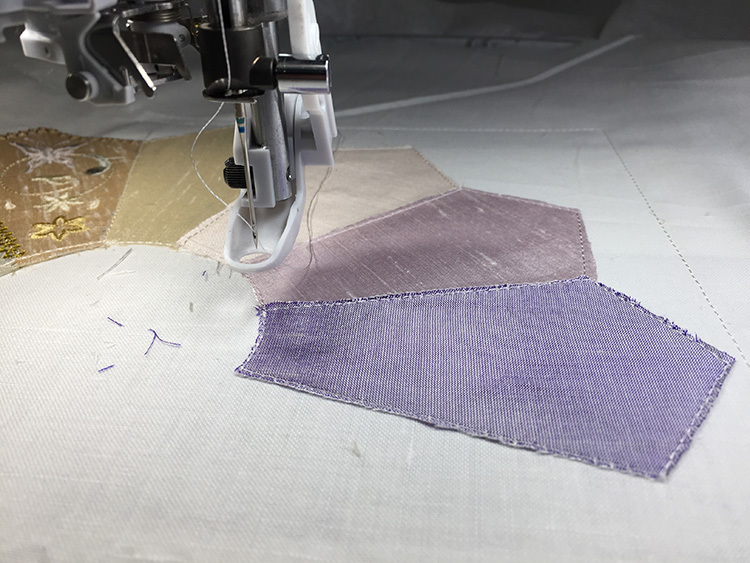 I also find it so much easier to stitch out this stage of the design using my foot control rather than just pressing the “start” button on my embroidery machine. 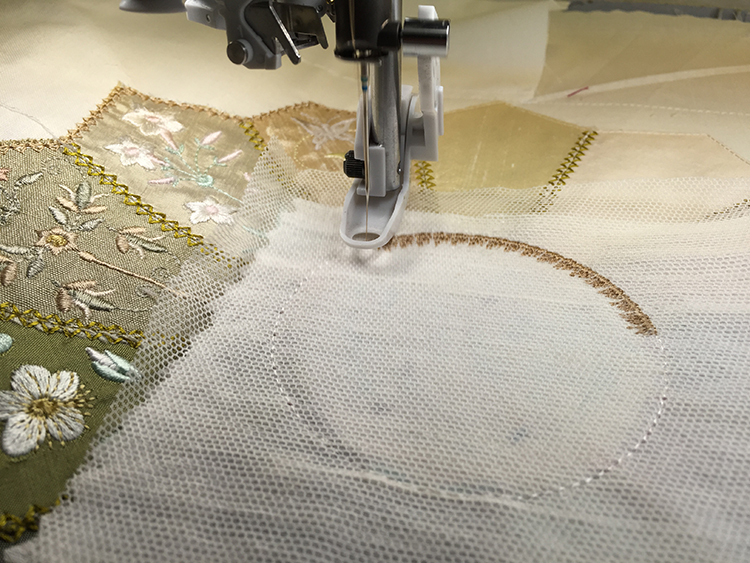 It relieves the stress, giving me both hands free to adjust the design as I go and I can control the speed of the embroidery with my foot. The colours went on well and my extra stitches to hold them in the middle helped prevent puckers developing. Best not to trim the inner edges as much as I have done though. Liking the way the colours were developing, I was wondering if the second join would be as good as the first. They joined perfectly which was a relief. The progression of colours had worked well considering they had been taken from my remnants basket. At this point I realised that alternating two fabrics would also give very different look or perhaps using a brocade and editing out the embroidery on some segments. 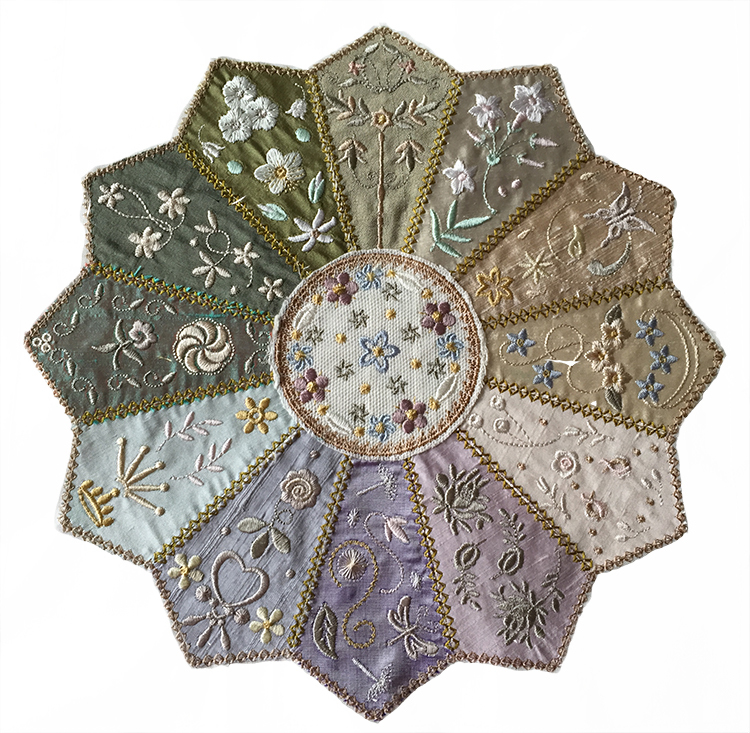 There are endless options for this block to personalise it and make your own unique Dresden crazy quilt. As I was working lots of ideas were coming to mind and obviously how to digitise the design so you can make these choices easily. 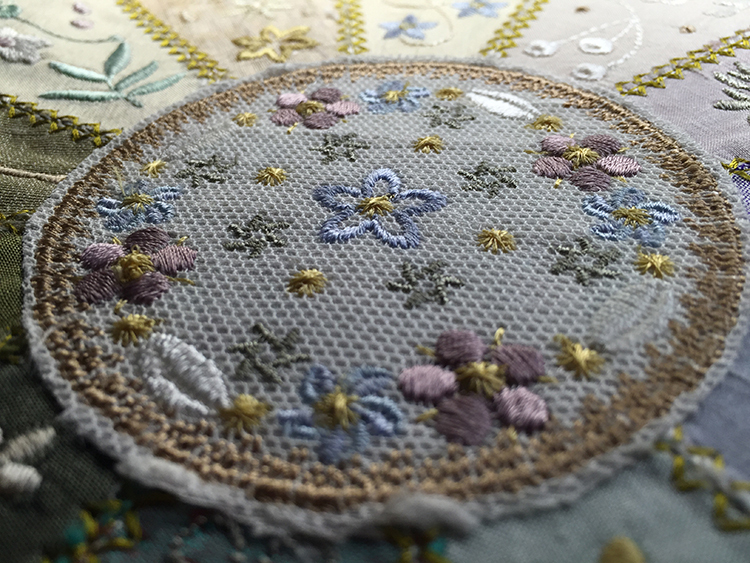 Once the decorative embroidery stitches started to cover the fabric edges it was impossible to see that joins. However some may prefer not to stitch them all in the same colour so I need to offer that option. I also decided to make more of the outer edge decorative stitching. It was at this point that I had a brain storm and made an unwise choice in my selection of the fabric for the centre of the Dresden quilt block. I was looking for a shot silk that would compliment all the silks I had used. Sometimes it is good to go with choices that are not within your comfort zone. 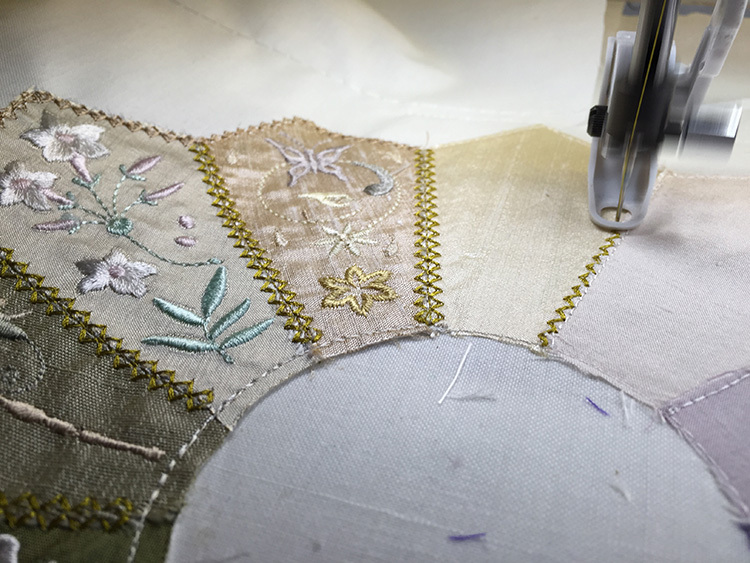 This time it really did not work and despite embroidering all around this addition, I had to spend an hour unpicking, mostly on the back, it as I was not happy at all. Eventually I had all signs of this dark pink thread removed. I carefully loosened my hoop and gave the sides a little tug to remove any slack resulting from my unpicking. I tightened the hoop and returned it to the machine, slipping a floating piece of stabiliser underneath as it had been destroyed during the unpicking. I tested the alignment of my design after all this tugging, as before inserting the needle at various points to make sure nothing had moved. Then I looked for an alternative fabric, one that would cover up this mess. Because of the glue I had used to fix the fabric in place there were lots of dark fluff. Sticky tape around my fingers removed some of the debris but I needed to attack the stubborn ones with the tip of my seam ripper. I had thought to add a heavily slubby ivory silk, but I knew some of the damage may show through and I was worried about the edges which had undergone severe stress. A very narrow lace could be hand stitched around the centre if need be and then I remembered my Valentines crazy quilt block where I had added English net. If I trimmed the centre fabric after it had been attached it would cover any damage or imperfections. I sprayed my ivory silk with temporary adhesive spray and applied ivory English net over it. I watched in delight as the embroidery stitched out. The net made all the difference as I forgotten I was creating a delicate porcelain look reminiscent of Dresden china. In making your choices I suggest that you focus on that and don’t make the silly mistake that I made with that dark pink silk dupion. However as I am so pleased with the result and that I managed to save the design, I am glad it happened! 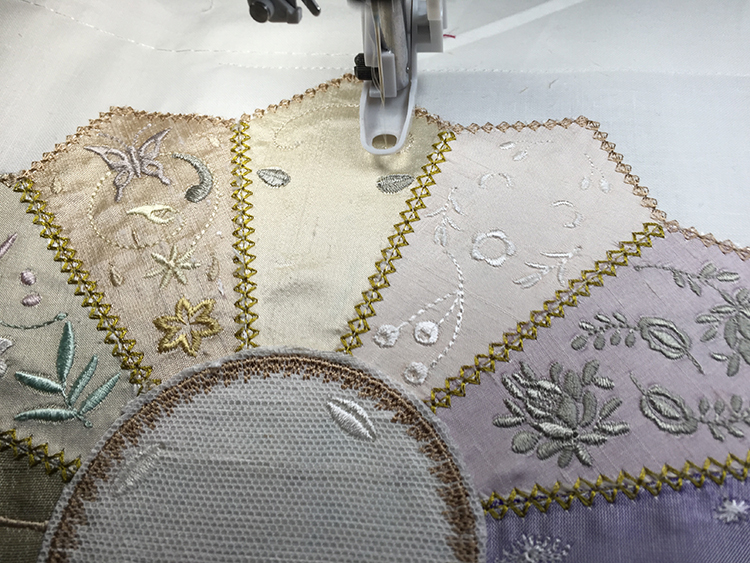 This crazy quilt block was a test stitch out but if I was going to use it, I would trim around the design and use it as an applique, adding some of the built in embroidery stitches on my machine to attach, complete and hide the edges. Hope you enjoy the challenge of embroidering out this design when it is released around Saturday 30th July, 2016. Between now and then I will be testing out the 5 hoopings required for those with only a 6″ wide hoop. More about that soon as I have some very special fabric to use for that testing. Click here to find out how you can pre order this design today! 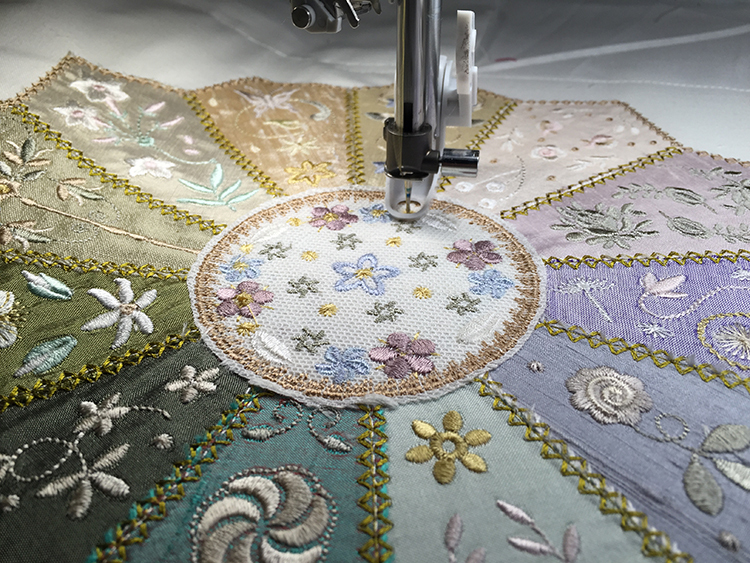 This entry was posted in Discussing machine embroidery and tagged Crazy quilting, development of embroidery, embroidery on silk, Placement of designs, quilt blocks, repairing mistakes, The importance of colour. Bookmark the permalink. It is truly beautiful and elegant. 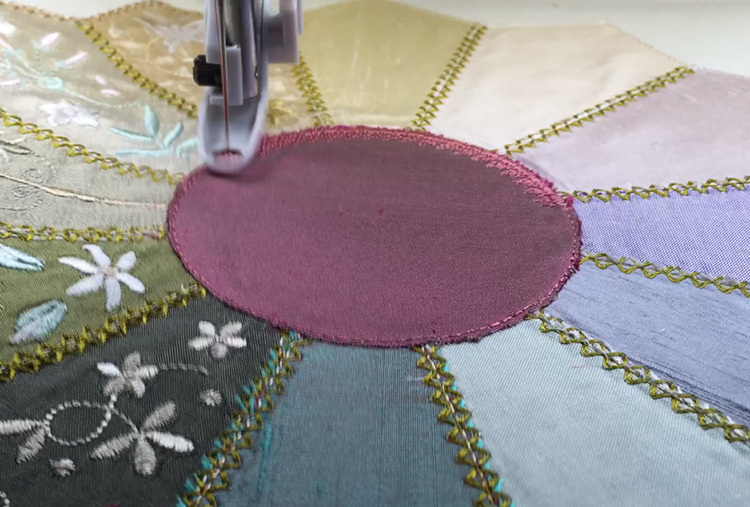 You are a master at embroidery and design.